Yesterday during the course of an excellent conversation with my colleague Helene, we discussed the idea that likely many of the “core values” of most human beings could be boiled down to a handful of statements that ultimately feed into all missions, goals, you name it. If we (the library, your org, agency) aren’t appealing to those core values or real driving needs of the community we’re often missing the point. One of those core needs is the need to feel “ownership” over things. We want to have our individual tastes, ideas, and products of expression represented in the world we inhabit. 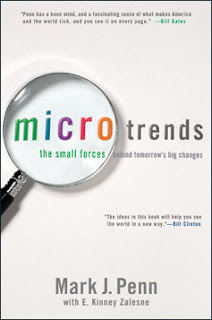 In his book Microtrends: The Small Forces Behind Tomorrow’s Big Changes, Mark Penn discusses the “niching” of our culture. This makes me think of the need for the individual to come out, to be heard or seen. By watching these niche movements we can tap into what’s coming down the pike before it hits us head on. What microtrends are you seeing in the community? Your library? How do we appeal to “the individual” when we’re also serving a larger community. It’s all connected…and quite fascinating (and intense) to look for the weave in it all. But look we must!